You are here: Home / Feeding / What Do Baby Chicks Eat? At that moment, I realized that I had become used to “artificially” raising chicks and was astounded by the site of this little family pecking and scratching away. Here they were, thriving in the wild. 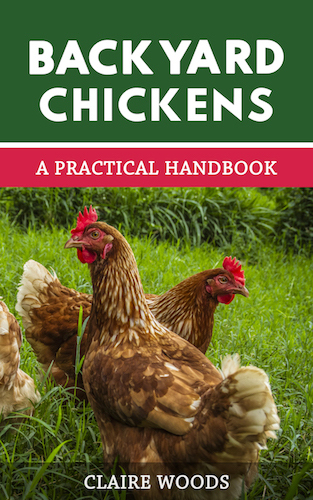 This was new to me because I could observe the baby chicks as they would exist in nature, and in doing so, I learned a lot about a chicken’s natural instincts and diet. I was familiar with how baby chicks learn to eat after raising a few hatchery clutches of my own. I usually panic and rush to teach them to eat after a new hatchery order came in. I had done it myself a time or two, so I wasn’t too concerned with their ability to eat on their own in nature. I knew that their instinct to peck to eat was extremely strong. It only took a few hatches of my own to learn that the sound my finger made while tapping on a food dish or fount was irresistible to a baby chick. So, the first thing I noticed about this beautiful trio was that the babes were indeed mimicking their momma as she clucked and pecked at bugs and other delicious snacks in the grass. 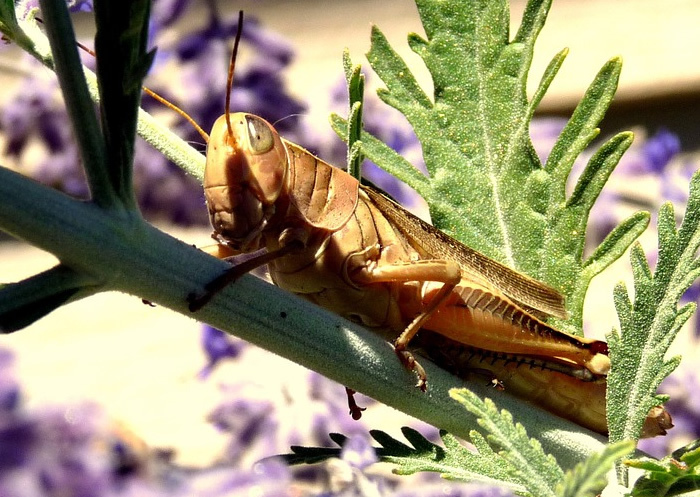 In the wild, baby chicks eat a plethora of bugs, greens, and even small worms. As they grow and become stronger, they become more able to seek out other delicacies like frogs, and even small mice. Yes, it’s true, chickens are omnivores. Baby chicks are no exception, however, when they are little, they take it slow and stick to bugs and greens unless momma assists them with a special meaty treat. 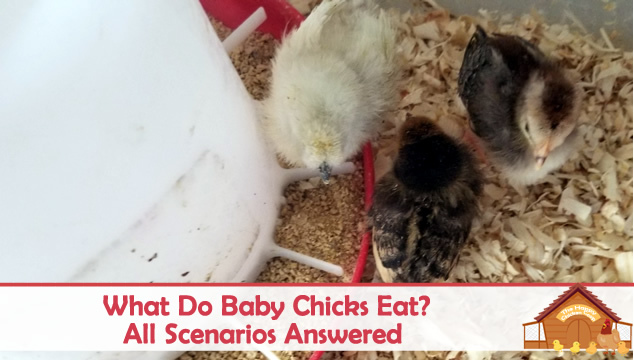 What to feed baby chicks depends on whether or not they are being raised by vigilant momma hen or if they have come straight from the incubator or hatchery. 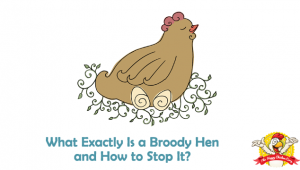 If I’ve allowed a broody hen to hatch her own babes, I will almost always opt to let her do the training. She will teach them how to eat all the things a good chicken eats, ahem ticks and mosquito’s, please! If my chicks happen to be free-range, it is entertaining to watch them learn how to catch bugs and worms. I love to pull up a chair and watch the chaos ensue. If one lucky chick discovers a meaty morsel, such as a tiny frog, the chase will be on. Its brothers and sisters will definitely try to get a taste. In addition to nature’s natural goodies that these free-range babies are consuming, I make sure to leave a helping of starter feed nearby, in case they need a little extra boost. I try to make sure the hen does not eat too much of this because it can cause her stool to become runny. This high protein crumble, typically consisting of grains, is a nice addition to the peeps’ regular, and natural, food. The only other reason to keep momma hen from eating too much of the starter feed is if it is medicated and we plan to eat her eggs. If she is eating medicated feed, we may also be consuming the medication while eating her eggs. If I have a brood of my own little ones from a hatchery, I rush to get food into their bellies as soon as possible. If they aren’t ready to eat, they most likely will ignore my efforts. Baby chicks have everything they need from the yolk in their egg when they hatch. They will not be hungry because, in a sense, they’ve just eaten a Thanksgiving feast. The yolk is absorbed into their bodies and provides all the nutrition they need over the next 48 hours. Some hatcheries will provide a supplement in the bottom of the shipping container in case the chicks have a longer journey than originally planned, or if they aren’t shipped immediately. Even in these situations, a chick will most likely be curious enough to start pecking at the supplement themselves. Their natural instinct to peck and eat is extremely strong. After hatching my own chicks, I leave them in the incubator until they are dry and fluffy. This usually takes about 12-24 hours. After that, I move them into their new home. The brooder box is already warmed to 95 degrees F, and food and water are ready for them. I feed crumble or starter feed that has about 20% protein content. If chicks are accidentally given adult feed, it can cause health issues. It is too rich for them and in some cases can be fatal. Most adult layer feed has more calcium than a little chick’s body can handle and not enough protein. Chicks grow extremely fast during their first few weeks of life, so it is imperative that they receive enough protein to support the rapid growth rate. 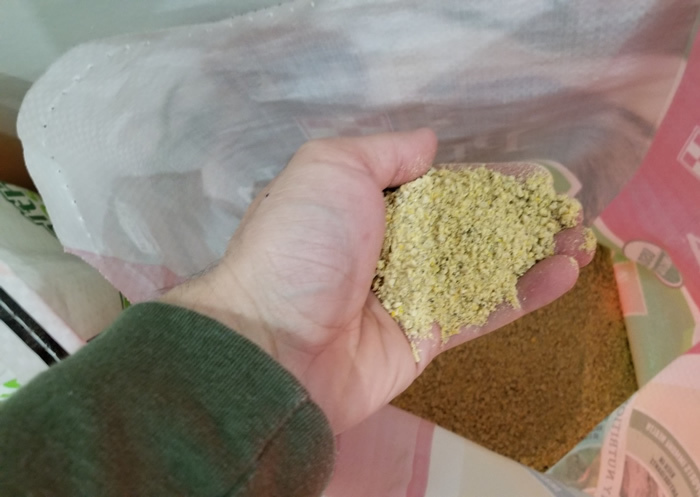 Grower feed is a bit different, it has a lesser percentage of protein, usually around 18%. 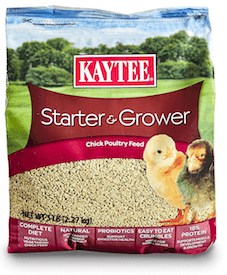 After kicking off your chicks with starter, which is higher in protein, transition to grower. Too much protein for too long can cause kidney problems in the future. A topic of controversy is whether to feed chicks medicated feed or not. If at all possible, I try to provide our animals with the most natural, chemical-free food I can find ( see below). With that being said, it is important to understand that the purpose of medicated feed is to prevent coccidiosis, which is a parasite that young chicks may obtain from pecking at feces that are infected with the parasite. Typically, this is most prevalent in dirty areas, or where many chickens are kept in small spaces. 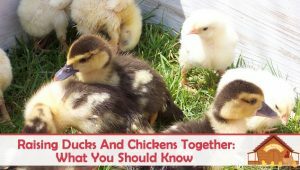 If I am hatching my own chicks, and I know my incubator and brooder is clean and clear, I wouldn’t necessarily have to purchase medicated feed for the chicks, however, I often do because of the “better safe than sorry” thought process. 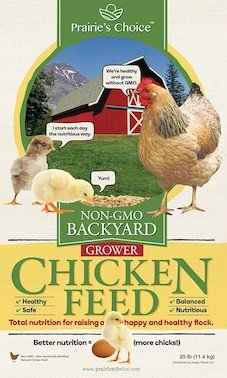 As long as I haven’t introduced any new chickens recently, and I know my current flock is healthy, I wouldn’t have to serve medicated feed to my chicks. As a society, we have accepted the thought process that a chick cannot survive without our care. Witnessing my hen successfully raise her chicks in the wild has proven otherwise. Unfortunately, I once made a grave mistake by assuming that, after another hen hatched her own chicks, they would be better off if I took them and placed them in a brooder. After all, I had raised numerous healthy chicks in my brooders. I wanted to ensure that a predator would not attack the babies in the wild. Unfortunately, the chicks died within 24-hours. I will never know what exactly caused the death of those two chicks, but I learned a hard lesson. I will never take baby chicks, that were hatched by their mother hen, from her again. 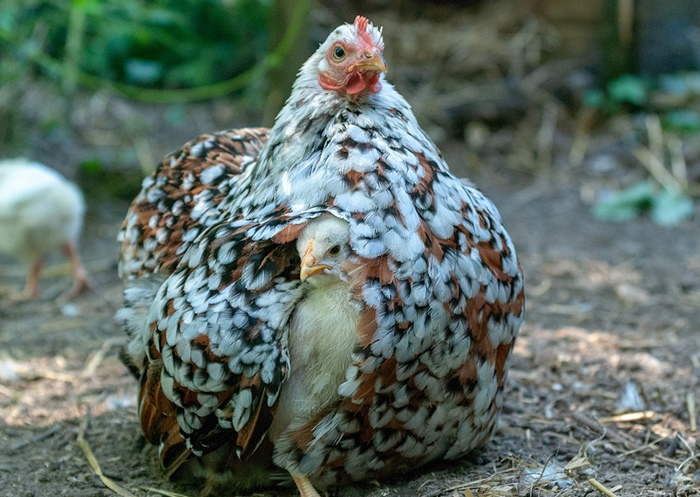 Not only did they not survive, but the mother hen was also a nervous wreck and it took weeks for her to make it through the grief. It was a horrible mistake that once again proved that nature really will find a way. Chicks are hardier than we realize, but what to feed them often comes down to making sure they are either allowed to thrive as nature intended or that they are provided with the nutrition necessary to make sure their speedy growth is supported. If I had the option to allow all of my hens to raise their own peeps, I would definitely take that route. Mother knows best in this situation, and her free-range babies have access to delicacies that brooder babies miss out on.